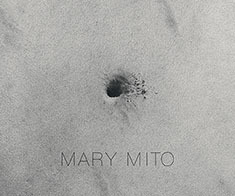 With uncanny skill, Mary Mito brings the world into focus—ripples on the water’s surface, a stick’s shadow, a scattering of sand. She convincingly renders sights that never call out to us, that we assume to be beneath our notice, like barren fields or animal tracks. What confers worth on such humble matter is her scrupulous and patient expenditure of attention. In Mito’s hands, extremes meet as mundane sites acquire mystery. She makes the rudest things eloquent. And because they are compelling to her, these things move us as well. She sees so that we may see. After living and working in New York City for thirty years, Mary Mito now resides in Santa Fe. Her work is in notable museums and private collections in the United States and abroad. Arden Reed, PhD, is the Arthur M. Dole and Fanny M. Dole Professor of English at Pomona College. He has held fellowships from the Guggenheim Foundation, the Rockefeller Foundation, and the Clark Art Institute, among others. He is the author of Romantic Weather: The Climates of Coleridge and Baudelaire, Constance DeJong: Metal, and Manet, Flaubert, and the Emergence of Modernism.